San Salvador is El Salvador’s capital, and the San Salvador metropolitan area is home to over 1,7 million people (2015), making it one of Central America’s largest urban centres. The city is located in the Salvadorian highlands, in the seismically active Boquerón Volcano Valley. The Boquerón Volcano is active, but hasn’t had an eruption since 1917. The average elevation for the city of San Salvador is approximately 650 meters, but parts of the city is found considerably higher than this at 1100+ meters above sea level. Soyapango, Mejicanos and Apopa have a bad reputation and locals who don’t live there tend to avoid these areas after dark. Teatro Nacional de El Salvador (El Salvador’s National Teatre) was opened in 1917 and is the oldest still running theatre in Central America. The theatre is used for plays, operas, shows, musical shows and dance performances. The building – designed by French architect Daniel Beylard and decorated by Italian architect Lucio Cappellaro – chiefly imitates French Renaissance style but with notable touches from other styles as well, such Rococo, Romantic and Art Nouveau. The ellipsoidal dome features the works of mural painter Carlos Cañas. Go to Museo Nacional de Antropología de El Salvador (MUNA) to learn more about El Salvador’s fascinating past. MUNA exhibits archaeological findings from the various cultural groups that have lived here, and puts these findings in a cultural context to help us understand those who have come before us. Estadio Cuscatlán is the largest football (soccer) venue in Central America, with room for over 45,000 spectators (53,400 according to EDESSA). The three major soccer teams based in San Salvador is C.D. Atlético Marte, Alianza F.C. and C.D. Universidad de El Salvador. For Atlético Marte, Estadio Cuscatlán is the home arena. Attend a church service at Catedral Metropolitana de San Salvador, or just admire the architecture and appreciate the cathedral’s importance in Salvadorian history. Catedral Metropolitana de San Salvador is the principal church of the Roman Catholic Archdiocese of San Salvador and the seat of the Archbishop of San Salvador. I holds the tomb of Archbishop Óscar Romero, who was assassinated in 1980. Romero was buried on Palm Sunday 1980, and gunmen firing at the funeral cortège caused a stampede that resulted in the death of four people. 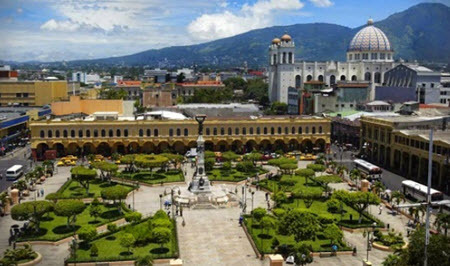 When the Chapultepec Peace Accords were finally signed twelve years later, the end of the bloody Salvadorian Civil War was celebrated in the square in front of the cathedral. Pope John Paul II visited the cathedral in 1983 and 1996. This is the main international airport in El Salvador, and it is located outside the city of San Salvador, in the department of La Paz. The distance between downtown San Salvador and the airport is roughly 50 km. The airport was placed out here instead of closer to the city to ensure that the airport would surrounded by flat land and have plenty of space to grow in the future, since the old Ilopango Airport in San Salvador was suffering from being in the middle of commercial and residential developments. Aeropuerto Internacional Monseñor Óscar Arnulfo Romero was previously known as Comalapa International Airport (Spanish: Aeropuerto Internacional de El Salvador) and before that it was the El Salvador International Airport (Spanish: Aeropuerto Internacional El Salvador). Ilopango Airport is the old main international airport of El Salvador. It’s located within the city limits of San Salvador and was therefore replaced as the main airport for El Salvador in 1980. Nowadays, it is used for charter aviation, air shows and military purposes. It was renovated and re-opened in 2009. The long-distance international bus company TicaBus operates a bus route that goes from Mexico through Guatemala and Honduras before arriving in San Salvador. From San Salvador, the bus continues to Nicaragua, Costa Rica and Panama, and then back again the same route. In 2007, the National Railways of El Salvador (FENADESAL) resumed operations after a long absence of railway service in the country. There is also a historic railway available, but it is only used by tourists – not for normal commute. This railway use train cars from the 1960s and is run by the ministry of tourism.